Food Label Printing Made Easy: Save time and money by printing your own labels with this FoodSoftware food label printing starter kit. All the components of a typical food label printing setup are combined here for your research and shopping convenience. If you do your research carefully, this is the selection of items you are most likely to buy. 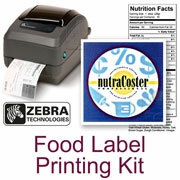 This kit includes a Zebra GX 430T Thermal Label Printer, ZebraDesigner Label Design Software, 4" x 6" Direct Thermal Paper Labels and nutraCoster Professional Nutritional Analysis Software. Food Label Printing Made Easy: Save time and money by printing your own labels with this FoodSoftware food label printing starter kit. All the components of a typical food label printing setup are combined here for your research and shopping convenience. * Mac Users: Please note that Windows is required for all the above. See the System Requirements section below for details. Label Software: ZebraDesigner software is like a word processor for labels; use it to design, save and print label files. Label design software is for composing the overall retail food label, including text (product name, description, etc. ), graphics (company or product logos, Nutrition Facts panel) and UPC bar codes. (Note that Nutrition Facts panels are actually graphics files created by the nutraCoster software; more details later.) ZebraDesigner includes a UPC bar code creator tool too. Installation of ZebraDesigner also installs the Zebra printer drivers. ZebraDesigner is the software that actually controls production label printing on the Zebra printer. Labels: Labels come in a wide variety of sizes and materials but the most popular label size by far is 4 by 6 inches, so a case of these (about 3,000) is included in this kit. The reason why 4 x 6 is because it is the largest label the Zebra prints, and ideally, you want only one label to do the whole job (more than one label is too much cost and work). For most products, 4 x 6 is the right size to fit everything: product name, description, company name, logo, UPC bar codes and Nutrition Facts panel. Important Note: The size of the Nutrition Facts panel is dictated by regulations so you may not have complete control over its size and shape, so the rest of your label design has to fit around it. Keep reading for more about this. Above is an example of a Side-by-Side format Nutrition Facts panel, one of a variety of regulation formats produced by nutraCoster. There is a divide point set by nutrition facts labeling regulations that greatly impacts your choice of label size. Regulations state that if your product package has over forty or more square inches able to bear labels (total surface not too scrunched or irregular to hold a label), you must use full-size Nutrition Facts panels (as nutraCoster will make correctly for you). Below forty square inches you can reduce Nutrition Facts panels mostly as needed. The smallest full-size panels that nutraCoster makes directly are 5 1/8" x 1 5/8" or 4 1/2" x 1 1/8". Yours will be that size or larger, depending on the number of nutrients, allergens and ingredients listed. This is why our starter kit label sizes are 4" by 6" -- they will use much of the space on a 4x6 label. However, you can use the text and formatting that nutraCoster provides to make much smaller labels. Under forty square inches able to bear labels, you can use the Linear format panel with type sizes down to 4.5 points (almost half the normal 8 point size), providing they are clear and comply with some other rules. Basically, using the ZebraDesigner software, you use the full-size label that nutraCoster makes as a model and copy the style so that what is larger and bolder remains such, only with smaller type. You should be able to make a Nutrition Facts panel for almost any small package this way. This starter kit product listing is here to make it easy to get what you need to start printing your own labels. The group of items in this kit are simply what many of our customers choose for their starting setup. However, the parts of this kit can be ordered separately and you can order different sizes and kinds of labels than those offered in this kit. Please call us at 805-375-7000 if you need something different than what is included in this listing. Option 1: Direct Thermal Paper Labels -- choose this option if your products have short shelf lives (a few days or weeks at most) and the labels need to be economical but not the best looking. These labels are best for baked goods and other fresh products. These labels are the least expensive (around 4.2 cents each for 4x6) because they do not need ink or ribbons. They are not for long-term labels because they are heat- and light-sensitive and so get dull over time. They are paper and do not stand up to moisture and wear. This option includes one case of Zebra 4x6 labels, part #10010049, with 6 rolls of 475 labels/roll. Option 2: Thermal Transfer Paper Labels and ribbons -- choose this option for long-life labels that do not get dull. These are paper and do not stand up to moisture and wear. These bright glossy paper labels require pigment ribbons. This option includes one case of Zebra 4x6 labels, part #82868, with 6 rolls of 420 labels/roll, and one case of Zebra 4.3" wide Wax/Resin ribbons, with 12 rolls, 244 inches/roll. Option 3: Thermal Transfer Plastic Labels -- choose this option for durable labels that stand up to moisture, freezing and wear and do not dull. This option includes one case of Zebra 4x6 labels, part #18926, with 6 rolls of 390 labels/roll, and one case of Zebra 4.3" wide Wax/Resin ribbons, with 12 rolls, 244 inches/roll. Any 32-bit Windows including Windows 10, 8, 7, Vista, Windows XP, Windows 98 ,Windows ME, Windows 2000 or later. 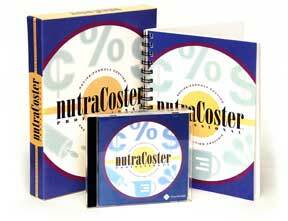 nutraCoster Professional 2.1 and ZebraDesigner will not run under Windows 3.1, Windows 95 or Windows NT. This system does NOT work with Macs, even Macs running Windows. Apple Macs: We do not recommend using Macs for label printing, even Macs with Windows, because Zebra printers (and most label printers) do not work with Macs. nutraCoster by itself can run under Windows on Macs. nutraCoster requires Windows to run and can run on recent Apple Macs providing they have Boot Camp or Parallels and Windows. nutraCoster does not run on the Mac operating system software without Windows. Zebra printers and ZebraDesigner software do NOT work with Macs, even with Windows. 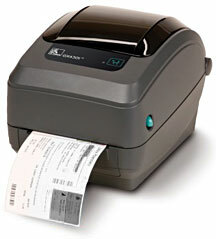 Printers, labels and ribbons are returnable within 20 days of delivery. Refunds are less shipping, 15% restocking fee and charge card merchant fees (if applied). nutraCoster is returnable within 45 days with no restocking fee.